Think of Italy and you'll likely imagine stunning vistas of ancient cities and dramatic coastlines. Think of Italian movies and you're sure to conjure up similarly misty-eyed visions of La Dolce Vita, 8½ and the like. Filmmmaker Gianfranco Rosi challenges such romantic preconceptions of his homeland and its culture with Sacro GRA, a challenging yet compelling portrait of modern Rome; a sprawling, crumbling city far removed from that which the tourists flock to see. 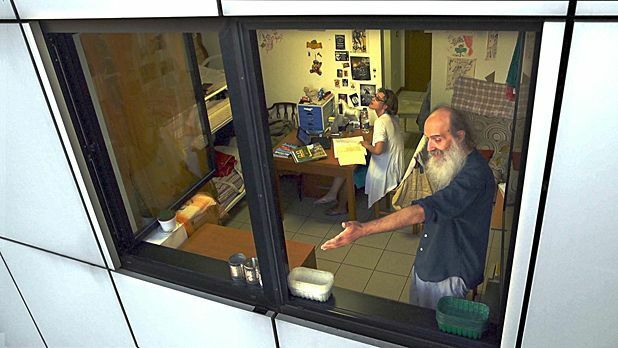 A documentary in its loosest form, there's no hint of context to be found in this series of vignettes focusing on those who live near the city's Grande Raccordo Anulare ring road (the GRA of the title, although this is never explained). Rosi simply points his camera at his melting pot of subjects, documenting snippets of their life. Along the way we meet a pair of exotic dancers working in a backstreet bar, the camera lingering on their skyscraper heels as they gyrate to a crowd of glassy eyed men. A young woman and her elderly father engage in conversations about life as we gaze in through their open window. An aristocrat luxuriates in his sprawling house, while two ageing prostitutes banter in their caravan home. And so on. While these individuals may be connected only by location, there is meaning embedded in Rosi's meandering film. Images of the circular, belching highway are joined by individuals walking (and talking) in circles, just as the camera circles back time and again to the same characters. In this way, Rosi seems to be commenting on the very nature of humanity, the repetition of the everyday that is such a universal experience. And while it may prove frustratingly mundane for some, thanks to its intrinsic humanness Sacro GRA has a quiet power despite its crumbling aesthetic. Limited release from Fri 7 Nov. Challenging yet compelling portrait of modern Rome, focused on those who live near the city's ring road, the Grande Raccordo Anulare (the GRA of the title). Images of the highway are juxtaposed with snippets of people's lives; while it may prove frustratingly mundane for some, it has a quiet power.